Mazda last fall updated a service bulletin to warn collision repairers that more vehicles could be affected with more malfunctions if painters refinish a front fender stay ground point. The September 2018 service bulletin posted on OEM1Stop (and no doubt on Mazda’s official OEM procedure site) replaces a technical service bulletin from November 2016. The updated Mazda document now warns that “one or more electrical malfunctions” could arise if painters coat part of a fender stay on the 2013-18 CX-5, 2014-18 Mazda3 and Mazda6, 2016-18 Mazda2 or 2016-19 CX-3. “The newly painted fender stay may be causing a poor front harness ground connection,” Mazda wrote. 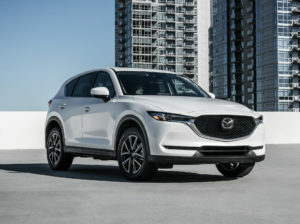 2013-18 CX-5 owners with a painted stay ground point might complain of a stalled engine, a check engine light, a dead heater blower and flashing headlights, according to a list Mazda provided in the bulletin. “During the dealer visit, the engine had a slow crank and no start. After charging the battery, the engine starts and the symptoms related to headlight and heater blower operation are duplicated,” Mazda wrote. The customer could also report that their CX-5 stalled while driving (!) and won’t restart, according to Mazda. Mazda said a dealer would find a Mazda scan tool can’t identify the CX-5 at all but a bunch of dash lights were on, as were the cooling fan and the ignition — the latter can’t be shut off, actually, according to the OEM. According to Mazda, the 2014-18 Mazda3 and Mazda6 have it a little easier. The Mazda3 could activate multiple warning lights if the area was painted, while the Mazda6 would display multiple lights while driving and dump a series of diagnostic trouble codes into more than one module. The solution is fairly easy, according to Mazda: Either don’t paint that part of the fender stay, or sand off the paint in that spot if it’s already been applied. It’s a simple enough issue and fix, but it’d be an awkward and potentially dangerous comeback issue if your shop missed this one. It just goes to demonstrate that the paint department needs to use OEM repair procedures too. For another interesting piece of collision repair trivia regarding ground wires connected to fenders, check out our coverage here.